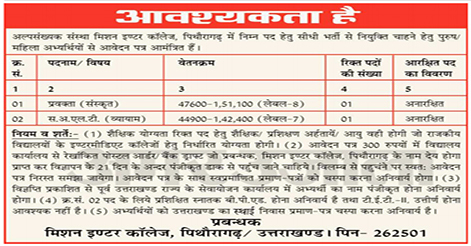 Mission Inter College, Pithoragarh has released an advertisement for filling up posts of Lecturer and Assistant Teacher (LT) on a temporary basis. Total No. of Post is 02. The Posts of Lecturer is for Sanskrit while the Assistant Teacher (LT) is for Physical Training. These posts are purely on Contractual basis. Interested candidates may apply for the posts on or before 14 February 2019. Educational Qualification: The educational and training qualification Government for all posts will be the same which has been prescribed for the State High School / Inter College from the State / University recognized by the State Government. It is not mandatory to have TET-02 pass certificate for LT Post. It is compulsory to have trained graduate B.P.Ed Degree for LT post. It is mandatory for the candidates to attach the permanent resident certificate of Uttarakhand with the application form. Interested candidates may submit their application form on a prescribed format to the undersigned latest 14 February 2019. Candidates have to send Self-certified photocopies of all certificates, caste certificate, and two passports size self-certified photographs with the application form. The candidate has to pay application fees of Rs.300 in the form of Demand Draft or Outlined Postal Order in the favor of “Manager Mission Inter College Pithoragarh” and send it to Office of Manager Mission Inter College Pithoragarh through Registered Post within 21 days of publication i.e. 14 Feb 2019. At top of the envelope having an application form, it is mandatory to mention Name of the post applied, Category of reservation and school name. Note: Name of the applicant should be registered in any Employment office of Uttarakhand and only permanent resident of Uttarakhand are eligible to apply. Appointment of the applicants is to be done according to the Uttarakhand School Education Act-2006 Regulation 2009 and according to the rule issued by the Government and Uttarakhand Government Secondary Section 04. Help us to improve this article/job posting "LT & Lecturer Recruitment in Mission Inter College Pithoragarh". We would be glad if you can comment below and provide your valuable suggestions and feedback. If this page have any wrong information/list or out of context content, then you can report us as well. Where to get the application form?? How can get application form? How can get application form ?